High spirits and hopes for Jeju people were in abundance for this year's Tamnaguk Ipchun Gutnori in downtown Jeju City. 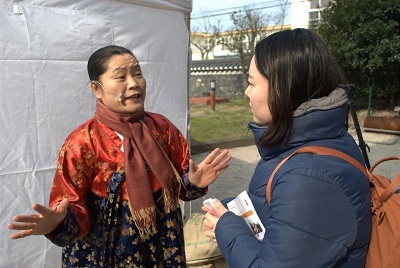 Sunny weather and traditional arts, crafts and performances greeted visitors to the celebrations at the historical site of Jeju Mokgwana on Feb 4. The annual event, now in its 17th year, is held to welcome the coming of spring with the hope of bringing prosperity and well-being to the province and its people. Central to the festival is the 'gut', an authentic customary ritual performed by a local shaman to pray, traditionally, for a bountiful harvest. It follows Shingugan, Jeju's mythological 'moving' season which sees the return of some 18,000 gods and goddesses to the island. 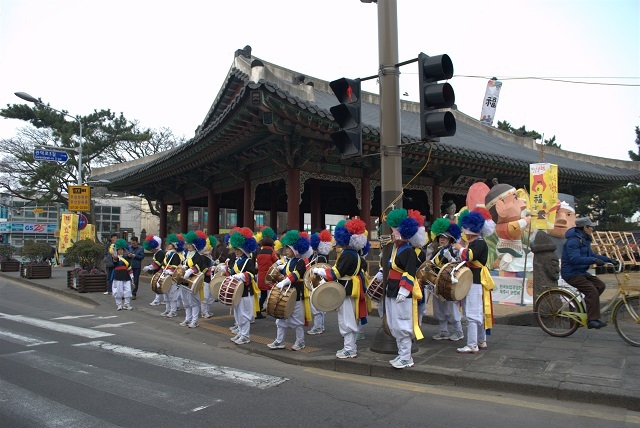 This year's festivities opened with a procession from Gwandeokjeong by traditionally costumed Jeju residents. 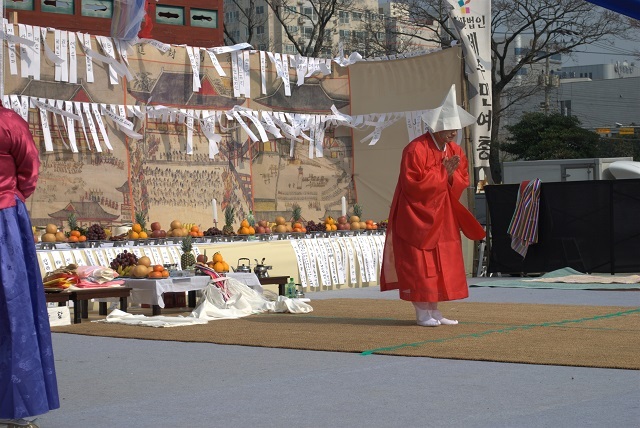 Dozens of visitors watched on as Shaman Suh Sun Sil took to a stage, setup between the old Joseon-era provincial buildings, to perform ritualistic chanting and prayers to the goddess Jacheongbi. 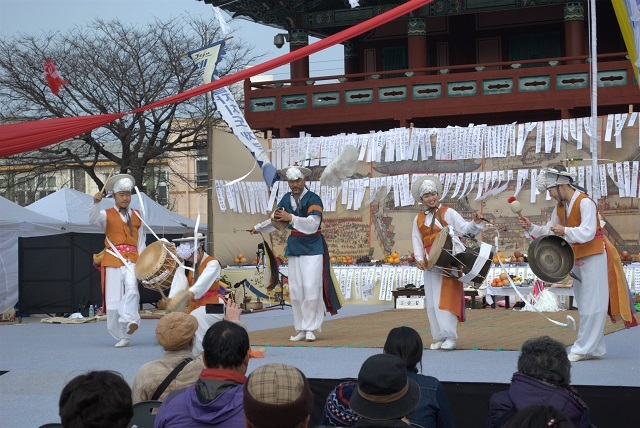 After the ritual, Samulnori performers Norianmaro filled the air with traditional Korean percussion music. Other festivities included traditional folk games such as paengi chigi (top spinning), rice cake making and bubble blowing. Tamnaguk Ipchun Gutnori has been a part of island life for more than 1,000 years and while it is no longer held in mainland Korea, organisers say this year's event proves it remains very much alive in Jeju. The ritual, passed down from the ancient Tamna kingdom, ceased during the Japanese invasion, but was later revived in 1999 by preservers of the tradition. While similar ceremonies take place in other parts of East Asia, Tamnaguk Ipchun rituals can only be seen in Jeju. Choi Sangdon, art director of Jeju People's Artist Federation, spoke of the uniqueness of the ritual to the province. He said: "Jeju is the only region in Korea that has the Ipchun ceremony. China and Japan also have it. "I think Jeju is a repository of cultures because we still have old Korean words, pronunciations, cultures and myths since the Tamna Empire." The ceremony has been adapted for modern times, as society shifts away from an agrarian to an industrialised society. Today, prayers offered in a ritual can include the well-being of a friend or perhaps for the financial success of a local business. Such changes were evident at this year's festival, with strips of white wishing paper, hanging by the shaman's altar, showing the names of Jeju store holders. Kang Jeong Hyo, chairperson of The Jeju People's Artist Federation, and an organiser of the festivities, said: "All the stores in the underground shopping mall joined to write their store’s name on the paper to wish for their success. As society gets industrialized and modernized, things have changed." Mr Kang also said the number of people taking part in and visiting this year's celebrations had increased. He said: "Compared to last year, many people joined today. Many reporters from media told me that the number of the visitors seems increased compared to last year. In that sense, I feel satisfied." ▲ Grace (right) speaks to Shaman Suh Sun Sil. Suh Sun Sil, a shaman and founder of Jeju Keun-gut (great rite), spoke to Grace Hyehee Kang about the ceremony and explained the meaning of Tamnaguk Ipchun Gutnori. She said: "Now it is the Ipchun period and before Ipchun, there is the Shingugan period. During Shingugan, all the gods and goddesses ascend to heaven to report for one year to Jade Emperor. "Then, as the new year starts, new gods and goddess who are designated their positions come and go where they are supposed to be in charge of. "So when we do a ritual on Ipchun day, the 18,000 gods and goddesses will help human beings. That’s why we do the ritual. "We’ve done the ritual since the Tamna Empire. By doing it, I feel comfortable and people cannot do it individually so we do it all together, at once. "It is important. Traditionally, if we don’t do the ritual, from old times, the older generations feel uneasy. What we eat, what we harvest from the land has grown from seeds sown by the gods."